After a couple of weeks in which preparing for and holding my first art show proved to be pretty much all-consuming, I was keen to get out into the landscape again, and to do so before winter started to rear its ugly head. By which I mean not the winter of crisp days on snow-covered hills, but the winter of rain and gloom that is the more normal state of affairs. Memories of a successful late autumn trip to the Lakes a couple of years ago were in my mind as I looked at the forecast to identify a likely window. The forecast appeared to be predicting conditions of valley mist and warmer on the tops themselves, or in other words temperature inversions. This was an opportunity too good to miss. Booked for a 7:30am getaway from home, I was awake before 5am and decided to get an early train. 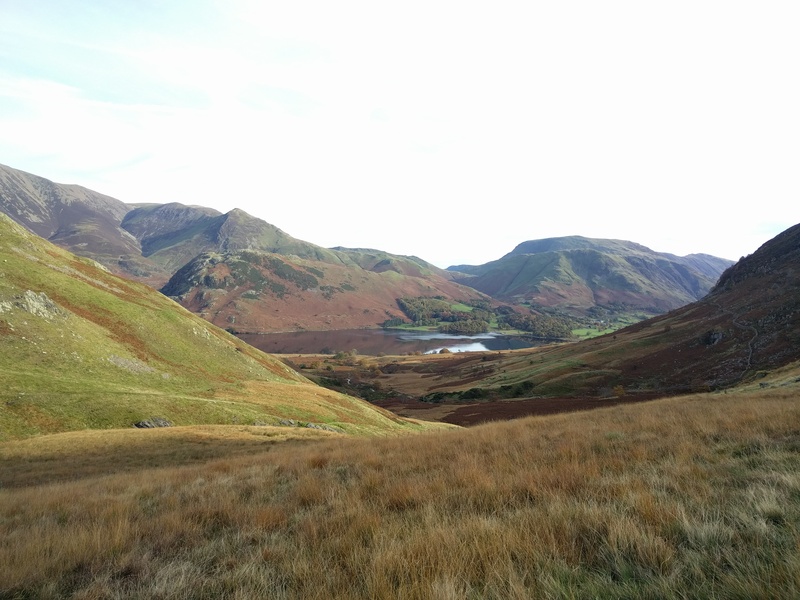 So I was walking soon after midday, leaving Braithwaite to begin the gradual ascent of Barrow. It’s a good vantage point to view the autumnal; colours of the Lake District. It was a bit murkier up top though and I ddn’t linger particularly. 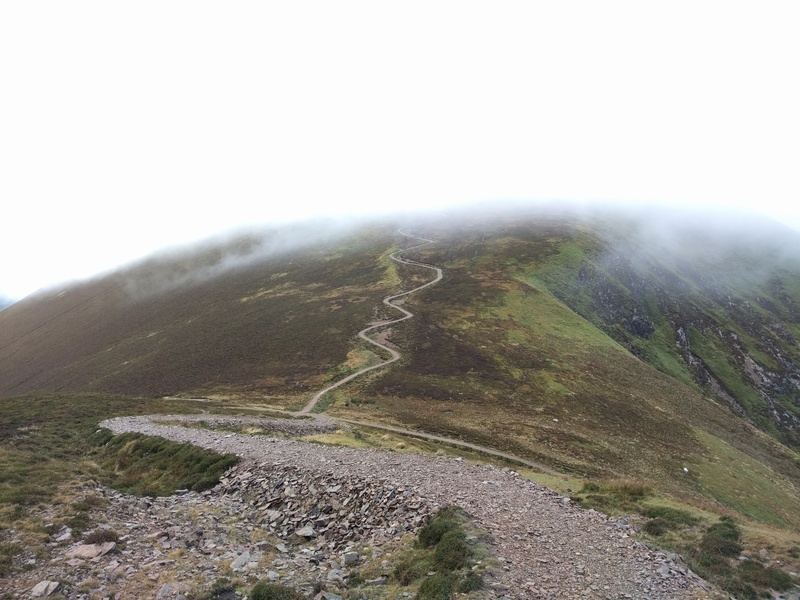 On to Outerside then Causey Pike and Scar Crags. As I walked down to Sail Pass, Sail itself still had its top shrouded in mist, but enough of the fellside was visible to see the recently reworked path. Not a fan of the look of it, albeit it will eventually blend in a bit better, I was certainly a fan of the progress it afforded. I well remember the slow tortuous ascent on a day walk in 2007. This time I was carrying full backpacking gear and made it up in about half the time. A bit of a clamber up onto Crag Hill, or if you prefer Eel Crag, this one also not being quite as hard work as I remembered. But here I was fully in the cloud and compasss was needed to make sure I headed in the right direction for my next target – Wandope. Similar skills were needed to find the right way down to Whiteless Pike and after a couple of false alarms with sheep tracks I was on my way. The daylight was on its way out and by now I’d realised I wouldn’t make Rannerdale Knotts tonight. Attention was switched to finding a suitable spot on the way down from Whiteless Pike. The tent went up just as darkness was falling. I was on my way early the next morning as I had a deadline, meeting friends for a walk. Given I’d stopped short of target last night, I needed to get a move on. Down to Rannerdale Knotts, time for a few photos, and then down to Buttermere, meeting Sarah pretty much the moment my foot touched tarmac. She drove us along to Seathwaite Farm to wait for Dave and Jim. The four of us walked out to Stockley Bridge and then up the Styhead path for a short distance to gain height before striking off to ascend Seathwaite Fell directly. Bit of a slog, especially for me carrying more than everyone else put together, but luckily I didn’t fall too far behind. We weren’t hurrying though. 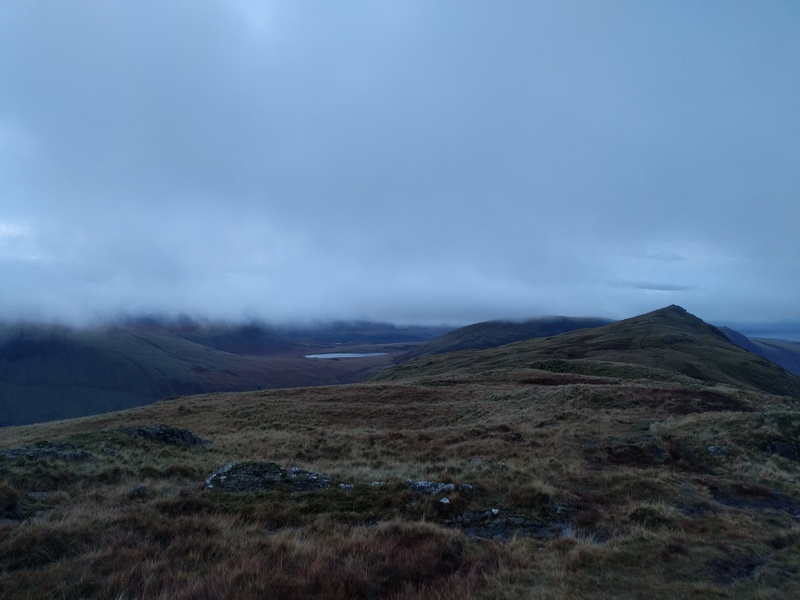 Then we walked along the top of the fell to Sprinkling Tarn where a decision was made to part. It was midday, and I was concerned I didn’t have time for the others’ planned detour to Esk Pike. So Sarah loaded me up with homemade cake and they headed off. 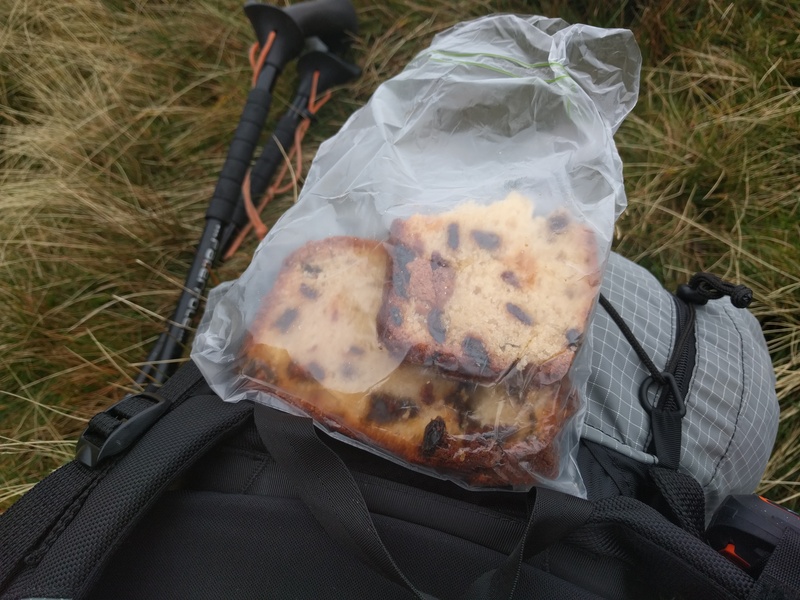 I dropped down the Styhead path a bit, stopped to refill on water, and then somehow pigged all of the cake. 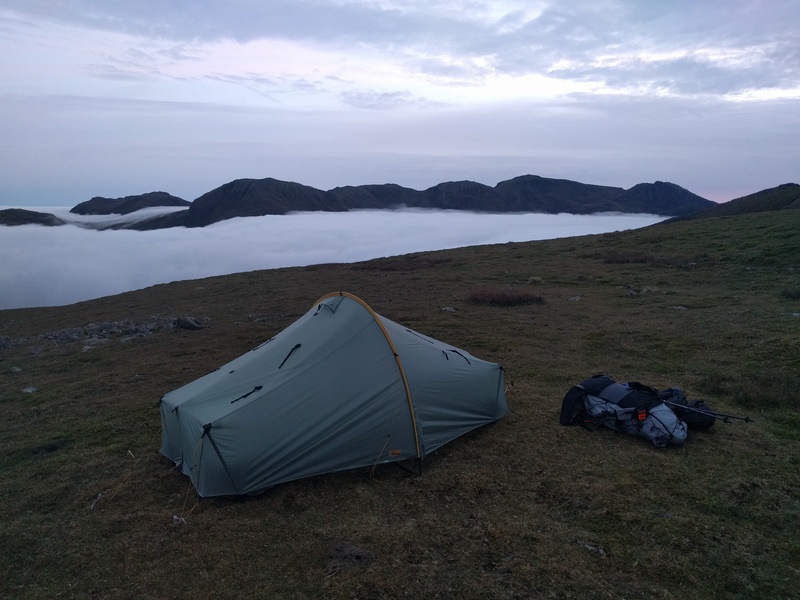 I took a slanting route from the bottom of Green Gable across to Base Brown, arriving there in cloud and sitting awhile trying to decide whether to camp there or press on. 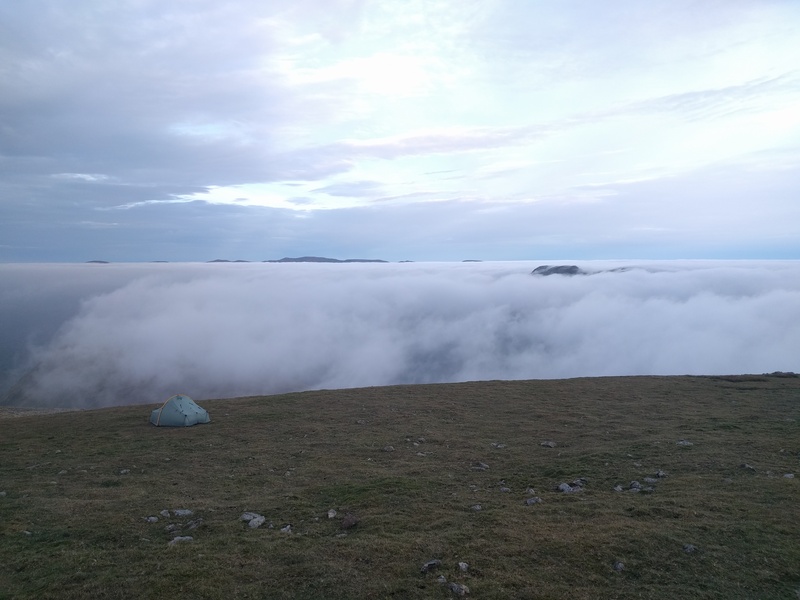 Seeing pictures posted of the total inversion the others were having on Esk Pike weren’t helping. In the end I decided to climb a bit and see if I could get something. So I walked up onto Green Gable. 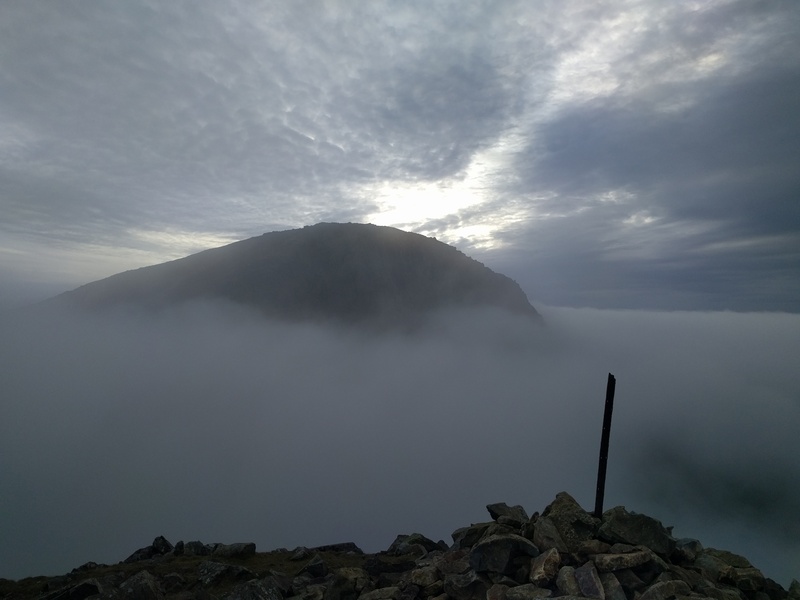 Mist swirled around me as I neared the top and as my feet stood on the rocks around the summit cairn, cloud parted to reveal Great Gable ahead. 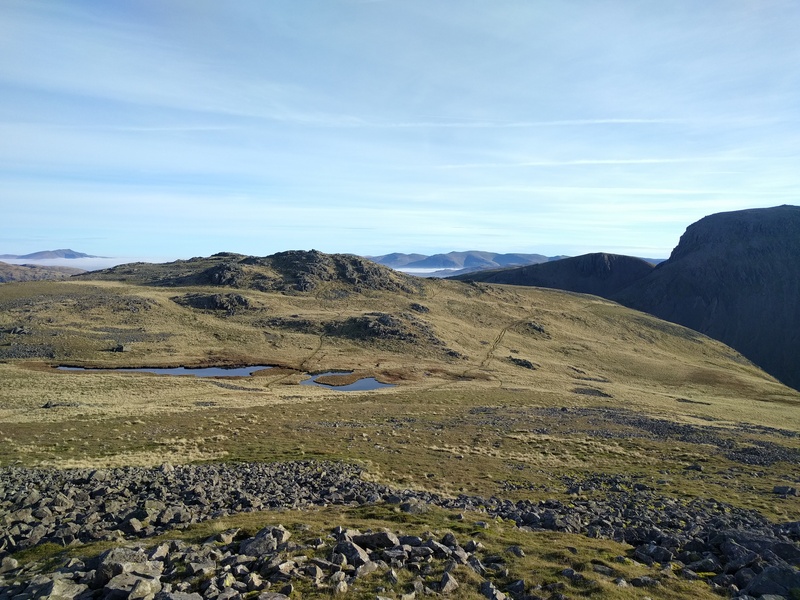 Around to my left a line of fell tops from Great End, through Ill Crag, Broad Crag, Scafell Pike and Lingmell slowly disclosed themselves, pointing out of the cotton wool. OK I was definitely stopping here then. I put the tent up and then in my walk around to find good vantage points to photograph the clouds found a better flatter spot, and so moved. Then I got down to the serious business of filling my phone with pictures and video. Of particular interest to me was the sunset, largely hidden by Great Gable, spreading an orange band over Kirk Fell and beyond, cloud pouring over Kirk Fell and Pillar into Ennerdale. So sharpely was it doing this that you could see the edge of Pillar and Looking Steads quite clearly as a fold in the cloud. The conditions stayed pretty fixed all night but a further higher band of cloud above ruled out much stargazing or moonlit cloud effects. Sunrise, though, was promising. Cloud lingered in the valleys, particularly so in the Thirlmere valley and down over Windermere. I got on my way with a descent to the Moses Trod path and thence around to Beck Head. An out and back trip to Kirk Fell was next, a fell I last visited in 2008. It was much better this time. Better still I found a better way down, with a track taking me down a grassy rake before joining the main path, neatly avoiding some of the more awkward bits (well awkward if you’ve got a big rucksack and are clumsy like me!!). I walked down to Wasdale seeking refreshment in the Wasdale Head Inn. And here I made a big mistake. I stopped for lunch, and it turned into the largest plate of ham egg and chips I’ve ever seen, let alone tried to eat. It blew me out. Afternoon progress was stymied by the drain of energy needed to process the enormous quantity of food. None of this was helped by the big fill up of water I’d also done. 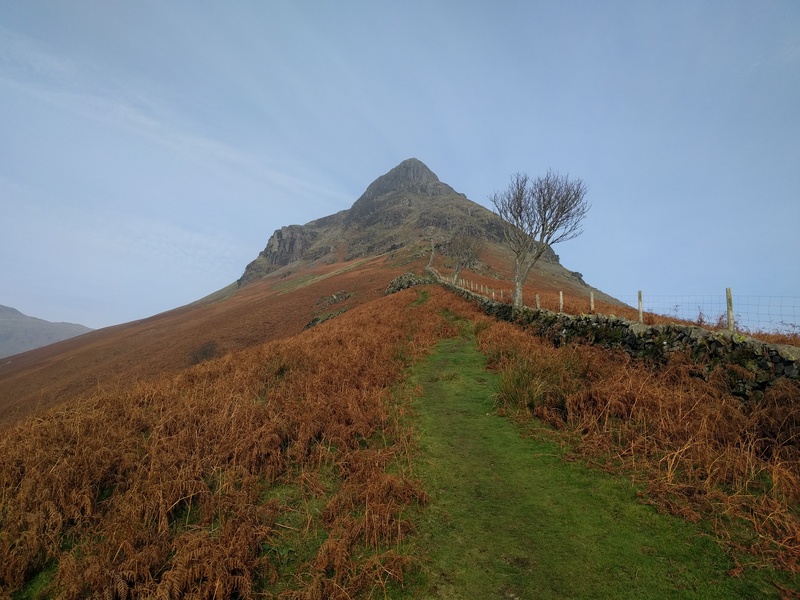 So progress up onto Yewbarrow was slow, painfully slow, and as I got to about the 300m mark I decided to take the path that contours around to Dore Head instead. This seemed to coincide with the lovely clear sky disappearing and the cloud rolling in. I made it Dore Head and pitched there. 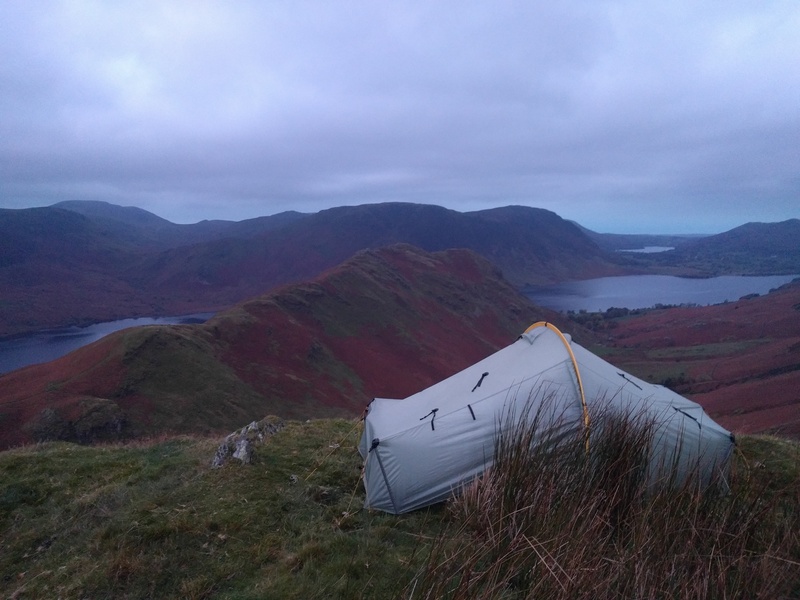 The failure to bag Yewbarrow, let alone get to Red Pike or even Scoat Fell, played on my mind and overnight a new idea came to me. So I forced myself to wake an hour and a half before sunrise, that giving enough time to breakfast and pack up. Everything was ready to go except the tent, ready for my return. 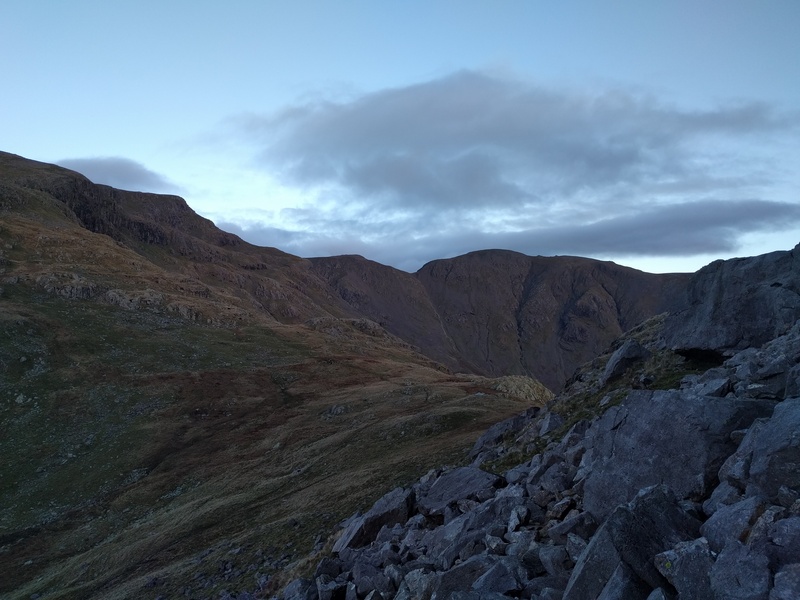 And so I scrambled up Stirrup Crag unencumbered. A couple of tricky moves were enough to convince me that not only did I make the right decision not to go down it in 2008, but that I’d made the right decision last night too. 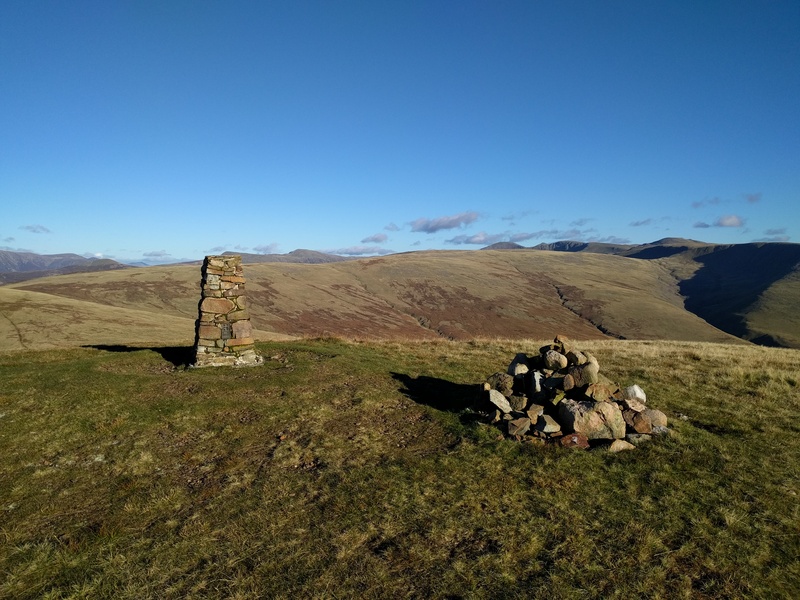 I reached the top and walked along to the proper summit. Some decent views towards the coast and on either side. 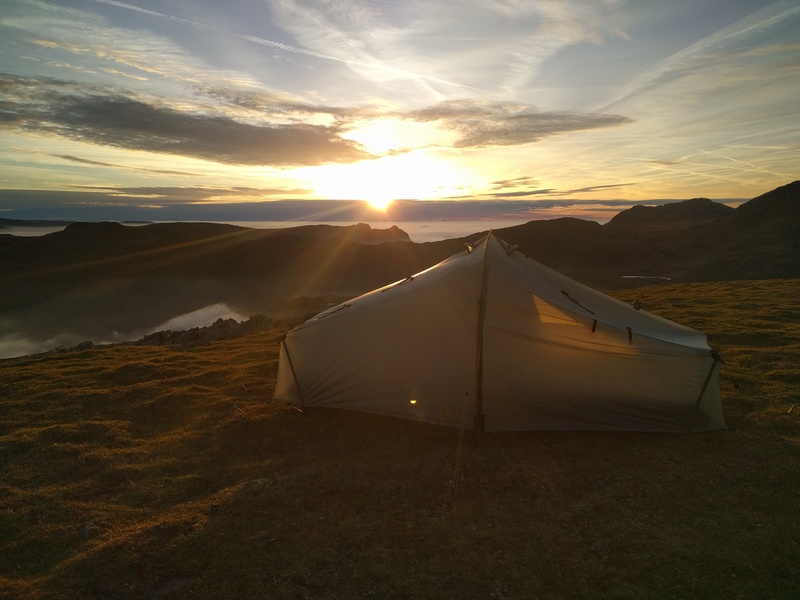 A sheep track took a slanting line off the top of the fell and took me right back to Dore Head, the tent growing larger in my vision all the time. 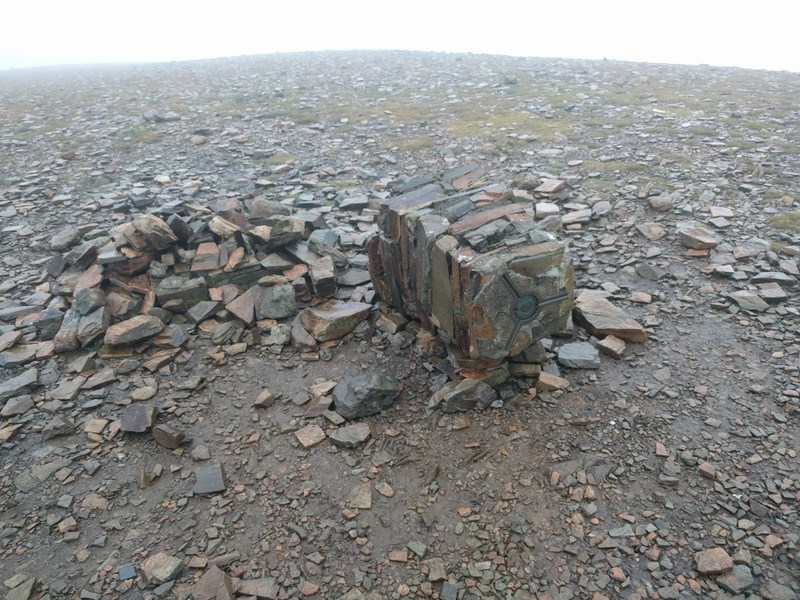 Soon she was packed away and I was climbing up onto Red Pike. More good views, but now the cloud had largely vanished over the fels themselves. Onto Scoat Fell and a detour out and back for Steeple. Along to Haycock, Little Gowder Crag and Caw Fell. Cerulean skies abounded. 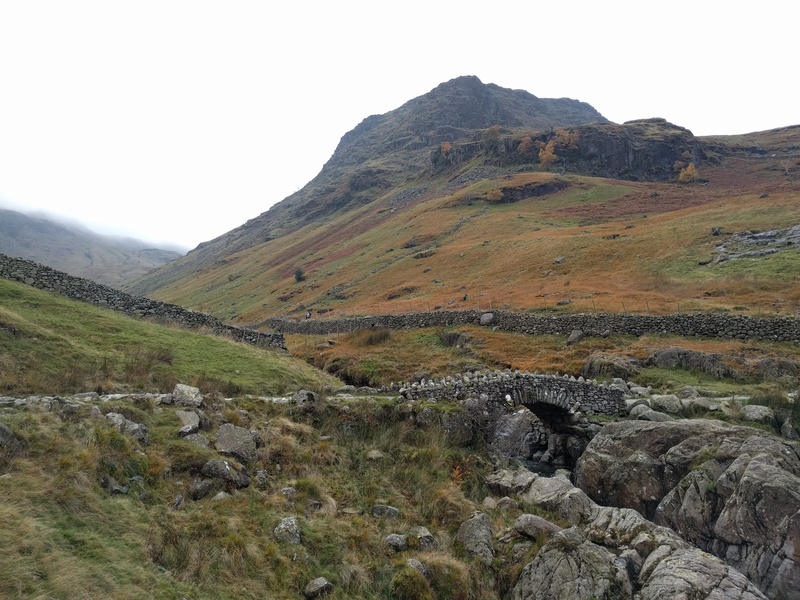 I reached Iron Crag and could now see enough of the rest of the day’s walk to start to judge finish time. It felt like it would be a bit touch and go for sunset in my planned spot. Lank Rigg proved to be quite hard work, involving a slip in the mud and a not very straight route up and over Whoap. Also not helped by walking into the sun so I couldn’t actually see the firm patches of path. I made it though. I dropped down to Black Pots hoping for a shortcut up onto Crag Fell or Grike. Barbed wire abounded, so I found myself at the obvious point on the map. 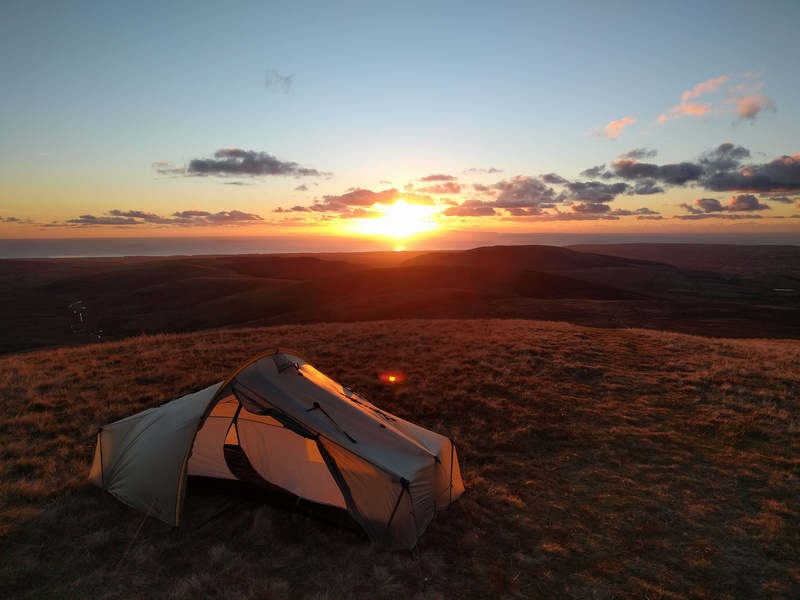 I decided to do Crag Fell first so that I could camp without the other fell being in the way of sunset. Naturally, the pitches available on Crag Fell were a little more to my taste than the one I ended up having when I got to Grike. Sunset was building on the way over to Grike, but I just made it in time for some pictures and to shoot a bit of footage. Day 5 came and I was undecided what to do. 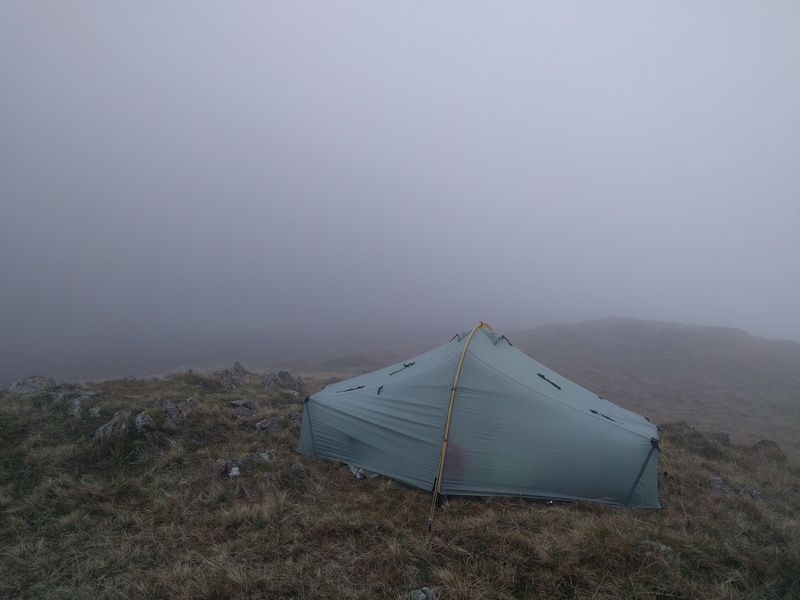 Night 5 was in prospect to be a bit of a come down after the camps I’d had and it looked like I’d be walking out in the rain. 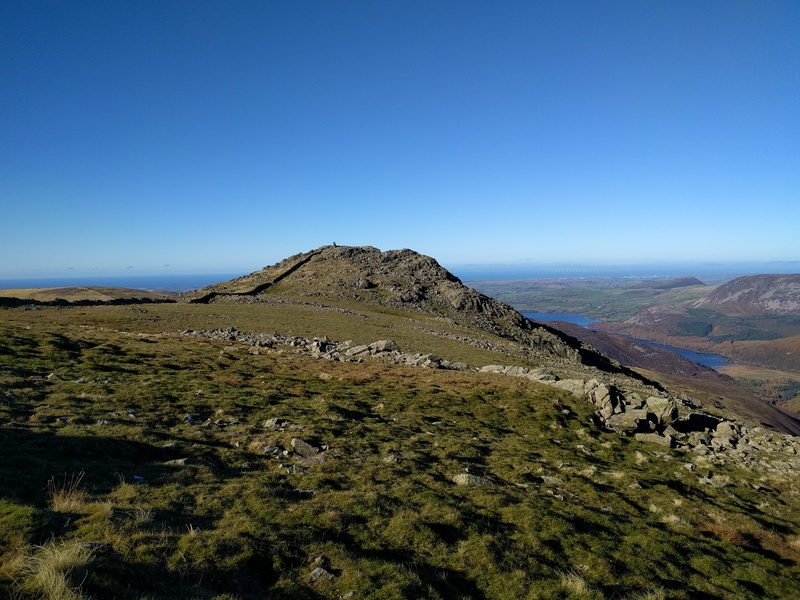 So I set off from Grike with 3 possible plans in my head – a walk out over the north western fells; a walk back up the other side of Ennerdale; or simply stopping at Buttermere and going home tonight. Subsconsciously though, I think I’d already decided to stop today. The walk down to the bottom of Ennerdale and then up to Floutern Pass took a bit longer than expected, and the walk became tortuous after Scale Beck, the path being a constant trial of boulders and boggy patches with Buttermere not seeming to get any closer. 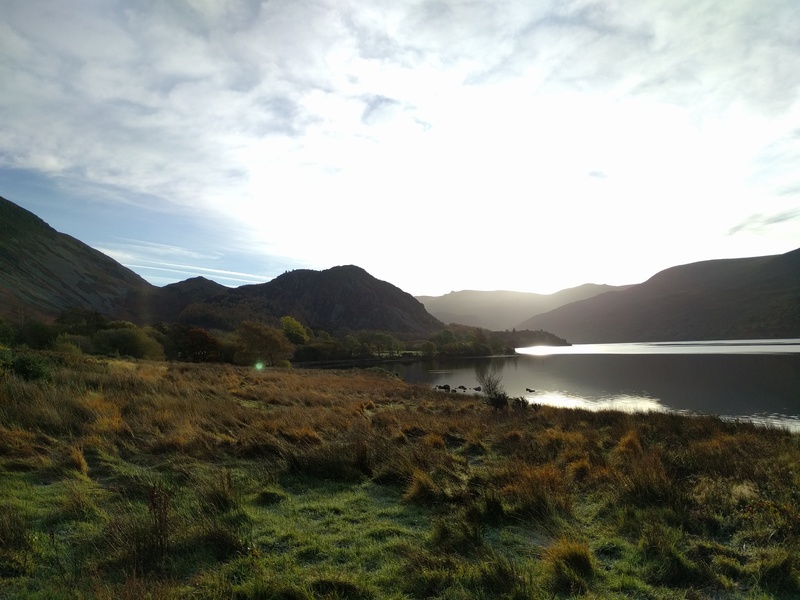 I rolled into Buttermere and was quite content to stop. I’d done over 9 miles and the prospect of the same again wasn’t appealing. Lunch and a pint in the Bridge Inn, were appealing though. A cheaper than expected taxi whisked me back to Keswick and the start of the journey home. All in all, it felt like I’d judged the timing of the trip right and called it a day at the right moment. By cutting it at Buttermere, I also left a logical chain of fells for a future visit to make planning a route next time easy. That’ll do then. Clicking on either map will take you to Social Hiking for a zoomable version. I missed the inversions by 2 days as I came home to Plymouth on Saturday 29th Oct. Couldn’t believe it, anything over 800m had inversion written all over it. Next year maybe for me!! 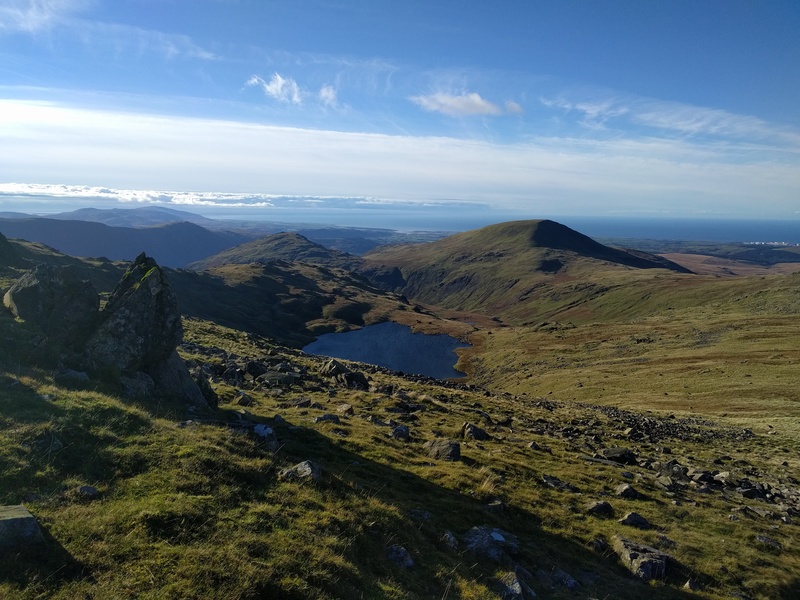 Great report and fantastic route. Great photos and route. Good to see the Scarp out again. Superb tent.